Simple Sauerkraut Recipe – Just in Time for Oktoberfest! So, you know we’ve got these fermenting crocks, and you know we think they’re awesome. You can see them in action in our kimchi and our pickles post. Of course, what good is a truckload of fermentation crocks without a killer sauerkraut recipe. Bonus: If you start your kraut now, you’ll have a fresh batch of sauerkraut for Oktoberfest. Because what’s beer and brats without sauerkraut? Before we start, let’s break it down: What is sauerkraut and how do you make sauerkraut that tastes awesome? Simply put, sauerkraut is fermented cabbage. Now, I know you’re thinking “eeew, fermented food is gross,” but you would be wrong. Other fermented foods that you probably know are: Kimchi, Pickles, Sourdough, Cheese, Coffee, Chocolate, Yogurt, Beer, Wine, Vinegar, and Miso. I’ve yet to meet a single person who doesn’t like at least one of those things. So get ready to be a home-fermenting convert. 2 heads of cabbage – Ideally organic – sometimes pesticides impede bacterial growth. Great for farmers, terrible for fermenting. Seriously. That’s it. All that punchy, funky flavor comes from the fermenting process. Here’s how to make sauerkraut in just a few simple steps. It really is a basic sauerkraut recipe. Shred or finely slice your cabbage. You can see in our photos that we did a coarser shred, but the finer the shred, the quicker to ferment. In a large mixing bowl (or the crock itself) toss the salt with the cabbage, kneading the salt into cabbage. Note: If you have cuts on your hands, this will sting. I learned the hard way. 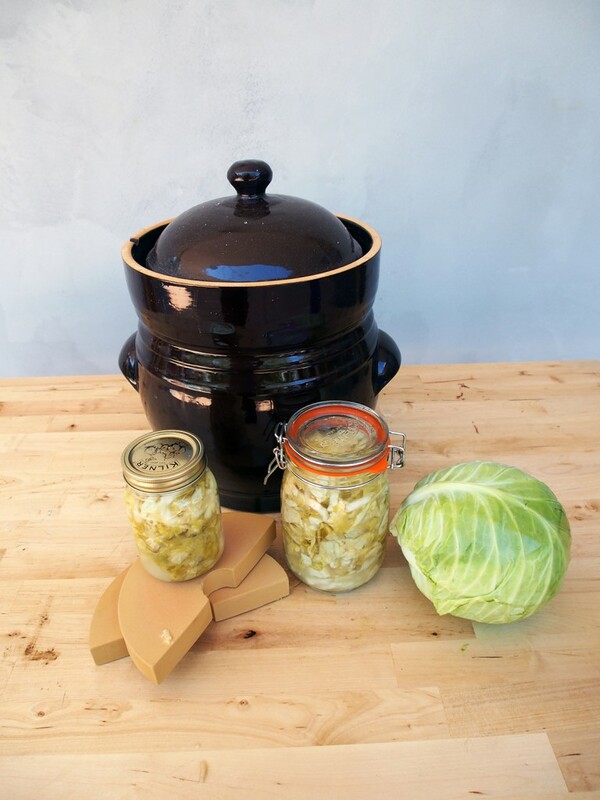 Once the cabbage has been thoroughly massaged and starts releasing liquid, pack it tightly into a crock. Use a plate, the stones, or a kraut pounder to pack it down. 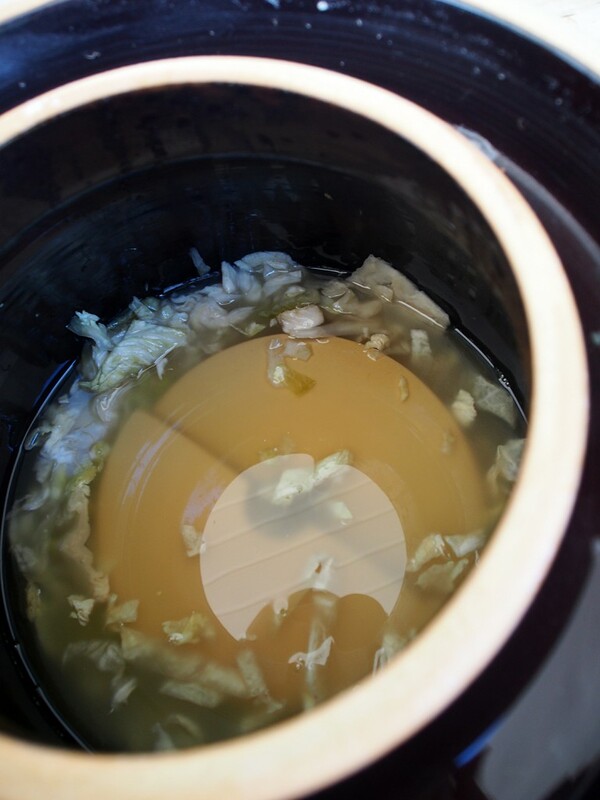 Once all of your cabbage is packed into the crock, pour any liquid remaining in the bowl into the crock. The crock should have released a more liquid during the packing process and be submerged or close to submerged in liquid. Put weights on the cabbage. The stone weights should be submerged in liquid by about an inch. If they’re not, mix a cup of water with a tablespoon of sea salt and pour enough to cover the weights. 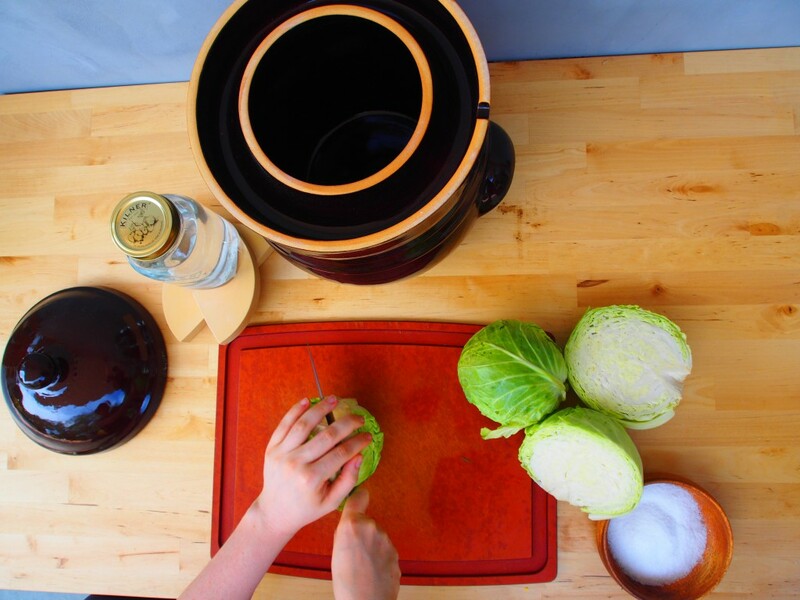 Once your weights are submerged and your massaged, salt-scrubbed cabbage (it’s like a veggie spa day) is packed in place and weighted, pop a lid on that crock. Move the crock to a cool shady place and leave it alone. At this point, your only job is checking every few days to make sure the kraut is still submerged. If not, repeat step 5. as needed. 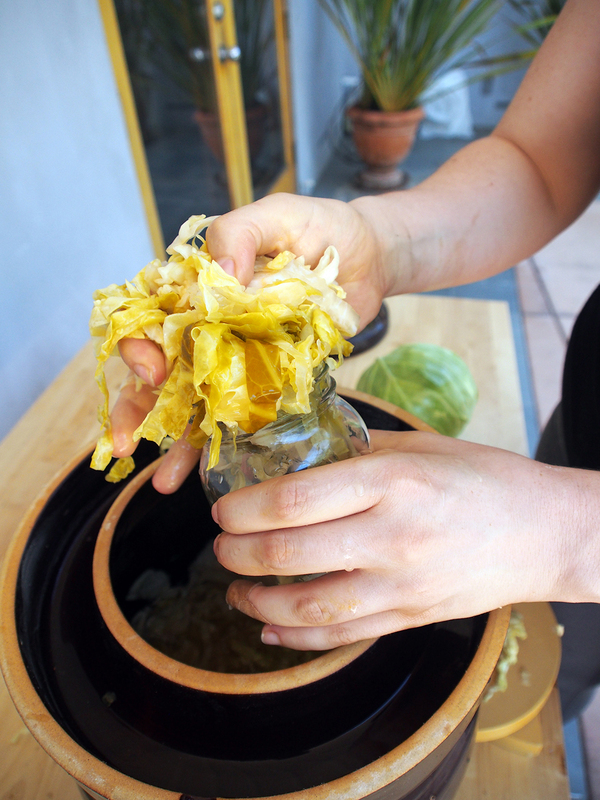 It can take between a month and 6 months for your kraut to ferment. I can’t imagine what 6-month fermented sauerkraut tastes like. Our Sauerkraut recipe was pretty perfect after 1 month. Once you hit about 4 weeks, start tasting your sauerkraut every 3 or 4 days. I like mine crisper, so 4 weeks was perfect, but the longer you keep going the softer and more pungent your kraut will become. A few notes: Sometimes you’ll see a little scum floating on your brine. Simply skim it off with a slotted spoon. Once your sauerkraut is done, there are a few ways to preserve it. Either pack it into kilner jars and keep in the fridge for up to a year or you can go about actually canning sauerkraut. We added 4 cloves of crushed garlic, a teaspoon of ground pepper and a teaspoon of sugar to one of our cans to experiment with flavoring–truly delightful! Try it out if you want some added flavoring. To can your sauerkraut, simply pack your kraut with brine into clean, sanitized Kilner jars. 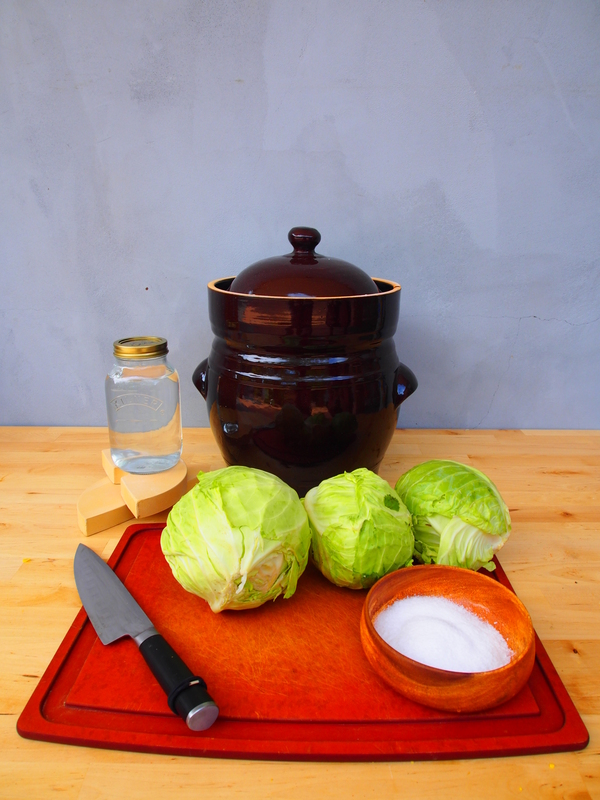 Leave 1/2 inch at the top of each jar, making sure brine covers the cabbage completely. Measure your head space from the top of the brine. Once your jars are packed, put the covers on. Bring a large pot of water to a boil and process the jars of sauerkraut for 25 minutes in boiling water (start marking time when the water comes BACK to a boil after adding the jars.) Remove from heat, allow jars to cool, check seals, and boom! Shelf stable sauerkraut. This entry was posted on Thursday, September 4th, 2014 at 5:00 pm and is filed under Canning, Do It Yourself, Fermenting, Fermenting Crocks, General, Homemade, Pacific Merchants, Preserving, Recipes. You can follow any responses to this entry through the RSS 2.0 feed. Both comments and pings are currently closed.